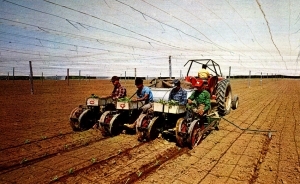 Description: Color postcard shows a tractor drawing a four-man tobacco planter. In the Connecticut River Valley the shade grown tobacco seedlings are brought from the seed beds to the fields in late May or early June. Boxes of tiny plants are placed beside each worker on the planter. As the tractor moves ahead slowly, the planting machine digs a hole in the soil, inserts the seedling, and pushes dirt around its roots.